The Men in Sheds project in the UK which we reported on a while back (a version of the very popular Australian Men's Sheds scheme) looks like it might start to finally kick off after having received $493,138 from The Big Lottery Fund (BIG): the money was awarded to Age Concern Cheshire for its 'Men in Sheds' project following a successful pilot scheme in Northwich. The programme supports men aged over 50 affected by bereavement, redundancy and depression and provides a place to socialise and learn practical skills. Alex Major of Age Concern Cheshire said: "There are a lot of projects for older people, but they mainly appeal to women and men can feel left out." Sanjay Dighe, chair of the BIG England Committee, called Men in Sheds a great example of the community-based schemes the organisation seeks to support. Tomorrow is the closing date for appplications for the role of co-ordinator. 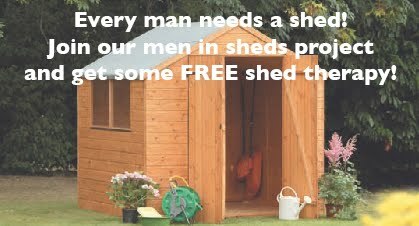 In May, Australia’s men’s health policy was launched by prime minister Kevin Rudd in a shed in Melbourne.